In an increasingly connected, techno-centric world, it is possible to interact with customers from Europe and colleagues from Canada. You can find brand advocates from any point on the map, and you can form relationships with fans and affiliates online but never come face-to-face with these individuals. Technology makes our big world feel very small. Most of the time, this connectedness is a good thing. It can enhance our customer service abilities, allow us to share resources or introduce us to people who can shape our world view. In business, this connectivity can allow us to hire employees located across the country who can join a team meeting through video chat. It can allow us to find new markets for locally-made leather goods from Indonesia. It can lead to increased sales from customers responding to a Facebook ad instead of a billboard. Technology can be incredibly beneficial for businesses. But, like any powerful weapon, it must be used responsibly. If you aren’t careful, technology can work against you. In an increasingly-connected world, it can be very easy to lose sight of who you are as a business and become just another monotonous, robotic presence online. Once you cross that threshold, it is only a matter of time before you start to lose customers who no longer find your organization valuable. So how do you avoid becoming a robot? It all comes down to one word: Authenticity. As a business, you must learn to combine your offline personality with your online presence, maintaining integrity in a world that is becoming increasingly digital. If you are a business who employs a marketing agency to promote your brand online or off, you have the added challenge of finding an agency that will communicate that humanity for you and represent your organization in a true, authentic manner. Before you can hire an agency to channel your authentic voice for you online, you’ve got to first develop the voice for yourself. You can’t depend on an agency to formulate and promote your story for you if you don’t yet know how to tell that story on your own. So, before you can begin your agency search, you need to do a little soul-searching. You know who you are as an individual. And, of course you know who you are as an organization. You know how to easily describe your mission, your product offerings and your target audience. Right? Or do you really? If you cannot easily tell your own story to your colleagues, at a cocktail party or on your website, then how can you expect an agency to tell that story for you. Before you can even begin to think about portraying an authentic voice online, you’ve got to understand what that voice is for yourself. You’ve got to understand you. To start, pull together your marketing department, your corporate leadership or your entire staff, if it’s possible. Ask questions of the group to gather an accurate representation of your company’s personality. What principles do you value? Do you support certain causes or organizations? What is important to you, as a business? Are you witty and sarcastic? Or are you serious and uptight? Are you very conservative and professional? Or are you more casual and fun? Once you have an understanding of who or what your company is, you can begin to outline your personality and your brand. Remember, you can’t tell an agency how to promote your company online if you don’t even understand who you are to begin with. Your company can’t be everything to everyone. Though that may sound appealing, it’s an impossibility. Your customers choose to do business with you for any number of reasons. It may be for your expertise in a certain area or your customer service abilities or your proximity to their location. And all are valid reasons. But you won’t be able to be all of those things to every single person. So, you’ve got to prioritize your values. Decide what matters the most to you. If you support your local community, you can’t realistically support every organization that comes calling. So select the organizations or causes that mean the most to you and your business and focus on those. Likewise, select social media platforms where you really want to engage and succeed. If you are not a huge global brand, you most likely won’t have 1 million+ followers on Facebook, Twitter, Instagram, YouTube, Periscope, Vine, and Pinterest all at the same time.That’s not to say that you can’t achieve that goal, but you shouldn’t focus on trying to be the most popular brand on every. single. platform. It’s exhausting. And could eventually dilute your brand. Start by determining where your target audience spends the majority of its time and work toward cultivating a following on those platforms. Create a voice that represents your brand and resonates with your audience on three or four platforms, instead of 10 or 12. You’ll end up being more true to yourself and your business than if you try to please every demographic on every social network. Understand what is important to your business and prioritize the things you want to focus on. Make a list and be ready to share that list at any time with your leadership, your agency and your employees. Once you know what your values and priorities are, you’ve got to make sure everyone in your organization is on the same page. Everyone speaking on behalf of your organization should be telling the same story. All of your employees, from the bottom of the ladder to the top, should understand your brand’s story and be able to communicate it accurately. Every medium should convey the same message, whether that be blogs, videos, social media posts, press releases or advertisements. All of your digital assets are just one piece of the same puzzle, one pixel making up the whole picture. Once you have the story you are going to tell, you’ve got to get your agency involved. You need to ensure that the organization crafting these messages and sharing these stories for you are speaking the language that resonates with your company and your employees. You’ve taken the time to develop your authentic story. You’ve gotten a great handle on who your organization is and what story you want to tell. Now you just need to find an agency that will be your brand champion online. There is a difference between branding and marketing. Marketing is the communication and promotion of your brand to those who may be interested in buying what you’re selling. Branding is the story, the image, the inherent qualities that represent who you are at the core of your company. And your agency should be able to help you with both. 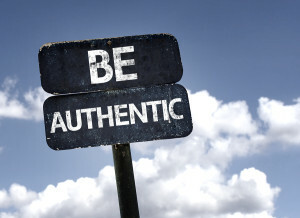 How do you know if your agency will be authentic to you? To know if you are going down the right path when it comes to selecting the agency that will take charge of the promotion and protection of your brand, it helps to do research into that agency first. Understand how the agencies you are vetting are portraying themselves and their clients online to get a feel for how that organization will represent your company online. When shopping for agencies, it is important to take note of how that agency portrays itself online. What story is the organization telling about itself on its website and on its social media accounts? Are the stories consistent? Do the messages feel authentic? Do you feel a sense of trust from what you read? If the agency you are evaluating appears to do well with telling its own story and promoting its own brand, then you should have a strong indication of how the team would represent and promote your company’s brand and story online. A well-crafted brand story should have some meat to it. If an agency speaks in vague generalities on its website, then how do you know what they will actually do for your own brand? As mentioned previously, it’s nearly impossible to be everything to everyone. Likewise, an agency who is trying to get everyone’s business regardless of budget, industry or needs, may not be able to offer the strategy and tactics that are relevant to your business. Spend time on the agency’s About Us or Services page of its website to get a feel for the tone and approach taken with each new client. Read through the process the agency takes with each new client to make sure you agree with the way the company will handle your business. Make sure you feel comfortable with the stories being told about the companies you are vetting before making a decision on who to hire. Most companies’ websites will include mention of a few of the organizations that have chosen to do business with them. Read through any online testimonies, but also click over to those clients’ websites and conduct your own research. Read these clients online stories, check out their social media posts and understand their own customer bases. Do you get a sense of authenticity for each different brand? Or are the stories all the same across similar industries? The right agency for you will be the one who will be committed to sharing your unique personality online regardless of how many similar organizations they may be working with. When it comes to hiring a marketing agency to represent your business online, you need to find the right voice, the right tone, and the right company to promote what is most important to you. Your money and your resources are valuable. So don’t waste your efforts by hiring an agency that is not going to distinguish you from the competition and who is going to simply create a robotic, automated, disingenuine tone of voice for you. Isn’t your brand important? Shouldn’t you want to work with a company that wants to protect that brand for you online? Because in reality, your online presence and business practices will long outlast any agency you choose to work with. Choose integrity. Choose authenticity instead.